Two men chat beside the sculpture of Japanese pop artist Yayoi Kusama in a newly constructed Sotheby's gallery in Hong Kong Friday, May 18, 2012. 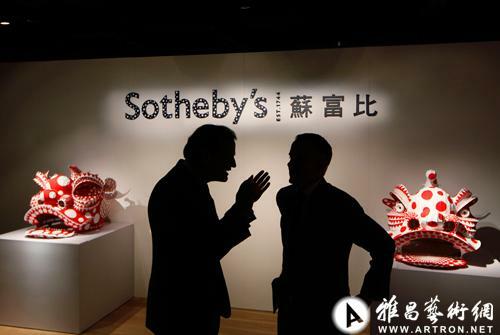 Sotheby's launched Friday its new gallery with 15,000 square feet for expanding its business in Asia. AP Photo/Kin Cheung. Sotheby’s presents YAYOI KUSAMA – Hong Kong Blooms in My Mind, a unique selling exhibition of works by phenomenal contemporary Japanese artist Yayoi Kusama to be held from 19 to 31 May 2012 at the newly-constructed Sotheby’s Hong Kong Gallery on the 5th Floor of One Pacific Place, Admiralty. One of a series of exciting events celebrating the opening of Sotheby’s Hong Kong Gallery, this exhibition marks a significant expansion of Sotheby’s business in Asia beyond its traditional twice-annual series of auctions in April and October. Personally titled by Kusama, the exhibition YAYOI KUSAMA – Hong Kong Blooms in My Mind is the result of direct and exclusive collaboration with the artist, her studio and the artist’s long-standing Tokyo gallery, Ota Fine Arts, presenting an assemblage of nearly 40 works of the highest quality with prices ranging from US$20,000 to US$700,000 (approximately HK$160,000 to HK$5.5 million), all of which are available for private sale. The works included in the exhibition cover a wide range of media including works on canvas, sculptures of various sizes and unique works on paper, and encompassing many periods of the artist’s development from the 1950s to present. The artist has been an integral influence in curating this show, which is a celebration of her dynamic body of work and its importance in Hong Kong and the global contemporary art market. Hidenori Ota, Director of Ota Fine Arts, says, "Yayoi Kusama is a legendary living artist in the history of Post-War Western Art, as well as on the brinks of becoming likewise in Asian Art history. Her borderless mind travels freely and I truly believe that her works will be loved by all Asian people - she is the Pearl of Asia." With large-scale retrospectives held in major museums and galleries worldwide, Yayoi Kusama is one of the most influential figures in the Eurocentric modern and contemporary art history. Born in Nagano, Japan, in 1929, Kusama moved to New York in 1957, launching a successful and prolific artistic career with works encompassing a variety of media from painting and sculpture to anti-war demonstration and film production, garnering much international acclaim before returning to Japan in 1973 where she has continue to produce artworks and novels. Her creative journey spans the inception and flowering of many sweeping art movements and dominant schools of thought yet defies all classification. Affected by hallucinatory visions since childhood, she channels the uncontrollable psychic energies into her artistic creations, giving rise to motifs including the mesmerising polka dots and infinity nets that now stand as instantly recognisable symbols of contemporary art. As one of her artistic signatures, Kusama swells regular objects to abnormal size so that they become things of wonder, as seen in the Tulip with All My Love (Fiberglass reinforced plastic, urethane paint, metal, 2010, 295 (H) x 200 x 170 cm, Edition of 3+ A.P.1, unique colours on each work). With these works, Kusama highlights the degree in which the natural world appears strange and uncanny in modern culture. An installation of Tulips was exhibited at the Beverly Gardens Park in Beverly Hills in 2010. At monumental proportions and highly impressive, the tulip sculpture is being showcased in public at the lobby of One Pacific Place, Admiralty, from 17 to 20 May. The exhibition is also highlighted by a number of pumpkin sculptures in different sizes. Pumpkins are one of the most iconic motifs in Kusama’s work, a fascination that extends from the artist’s youth during World War II. While Japan’s food supplies were low, the Kusama’s family engaging in wholesaling maintained a storehouse full of pumpkins. Thus, Kusama has maintained an attachment to its irregular, bulbous form. The same applies to the watermelon motif, which though rarer also stems from the artist’s focus on growth and fertility. Many recurring forms can be found in Kusama’s work. Her dots, nets and pumpkins are some of the most easily recognisable, while the motifs of the watermelon and the Dress Hanger (Acrylic and fabric on canvas, 1981, pictured right) are much more obscure. Only a few examples of each were created throughout her career, in different colours and sizes, and the work offered is one of them. A unique sculpture from 1986, Increment in the Spring (Mixed media, 1986, 100.3 (H) x 60 x 30 cm) is a grand explosion of the artist’s signature bulging forms. The work showcases the artist’s ability to imbue the everyday with psychological intensity and dreams of fantasy. In Increment in the Spring, Kusama places hundreds of phallus-like forms in a spotted box creating a comical composition whose bumps and bulges are strange and intriguing. First Life Study No. 2 (Gouache, pastel, watercolour on paper, 1953) was executed in 1953 during the very early period in the artist’s career, and it is rare to find works dated from this year on the market. The artist only began to create works on canvases six years later in 1959. The present work examines the artist’s obsessive relationship with dots which later materialised into her acclaimed Infinity Net series, examples of which are also featured in this exhibition. As a child, Kusama would have very elaborate dreams in which polka dots of different colours figured very prominently. Instead of trying to eradicate her obsession, she embraced it, making it the focus of some of her most important works.